Expression of gratitude can be healing to the spirit. We express gratitude with our words and our actions, but what about our bodies? When we practice yoga, as we settle into each asana, we acknowledge and celebrate all that our bodies are capable of. We are allowing gratitude to fill our hearts. We are showing appreciation for every breath that flows through our lungs and our body’s ability to move, stretch and hold; it’s ability to create it’s own source of heat. Join me for a one-hour post Thanksgiving all-levels vinyasa class. We will sync breath with flow as we steep ourselves in gratitude, building heat, flexibility and strength along the way. We will focus on asanas meant to open the heart, strengthen the core and lengthen the spine. Come to class with no expectations. 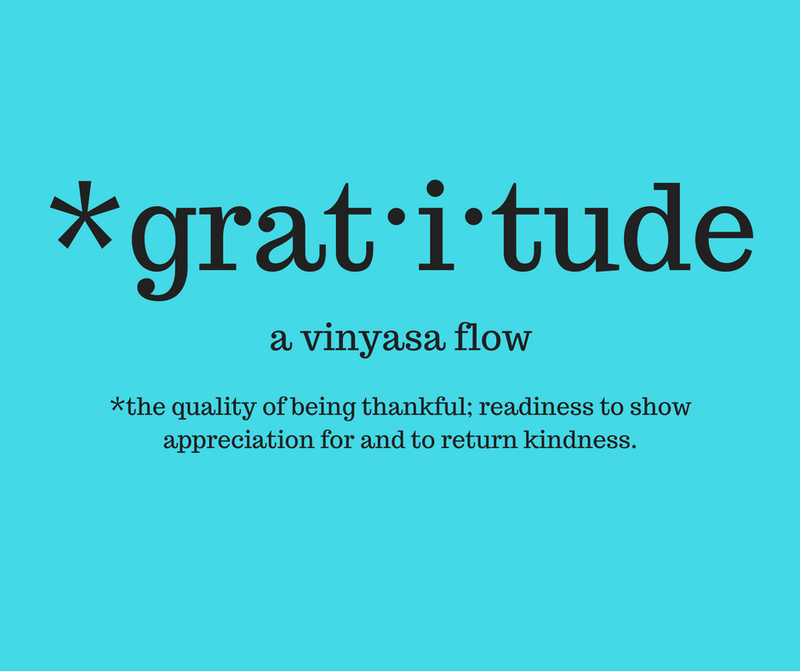 Bring only willingness and a desire to express gratitude. See you on the mat.